Punishment for sending offensive messages through communication service, etc. In easy words, Section 66A defines punishment for sending “offensive” messages through a computer or any other communication device like a mobile phone or a tablet. A conviction can fetch a maximum of three years in jail and a fine. The only problem is the vagueness about what is “offensive”. The word has a very wide connotation, and is open to distinctive interpretations. It is subjective, and what may be innocuous for one person, may lead to a complaint from someone else and, consequently, an arrest under Section 66A. Shreya Singhal, 24, the Delhi-based law student, was the first to challenge the law in court after the arrest of Shaheen Dhada and Rinu Srinivasan of Palghar in 2012 over a Facebook post. The girls had made comments on the shutdown of Mumbai for the funeral of Shiv Sena chief Bal Thackeray. The arrests triggered outrage from all quarters over the manner in which the cyber law was used. . Shreya contended Section 66A goes against the right to free speech as enshrined in India’s Constitution. Her PIL cited the twin arrests as evidence that the law, though meant to protect citizens from defamation, can be used to restrict freedom of expression. Jadavpur University professor Ambikesh Mahapatra was arrested for forwarding caricatures on Trinamool Congress chief Mamata Banerjee on Facebook. Activist Aseem Trivedi was arrested for drawing cartoons lampooning Parliament and the Constitution to depict their ineffectiveness. Air India employee Mayank Sharma and K V Rao from Mumbai were arrested for allegedly posting offensive comments against politicians on their Facebook group. Businessman Ravi Srinivasan was booked by Puducherry police for an allegedly offensive tweet against the son of a former cabinet minister. 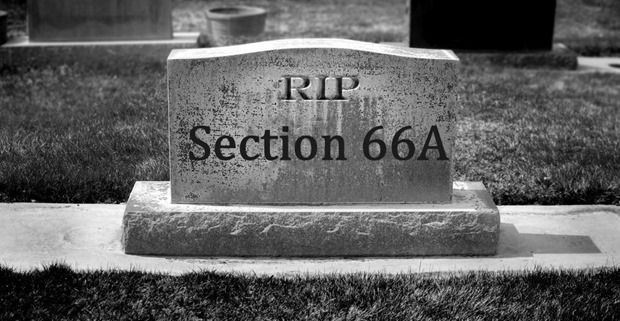 Finally, Section 66A of the Information Technology Act is unconstitutional in its entirety, the Supreme Court ruled on Tuesday striking down a provision that had led to the arrests of many people for posting content deemed to be “allegedly objectionable” on the Internet. The bench observed that Section 66A directly conflicts with the Right to Freedom of Speech and Expression, which is one of the most important pillars of our democracy and constitution. They said that people have a right to know, and no law should be used to stop that. As Section 66A is violating Article 19(1)(a), not saved by Article 19(2), hence its unconstitutional and has been removed henceforth. There has been an ambiguity in the minds of people as well as Law critics but major part is in the favor. This is a great step towards the sense of practicality and freedom of expression which our county very much requires. Please Share your views with us.